CHG-FM50: Smart Charger for NP-FM50, NP-FM55H, NP-FM30 Li-ION batteries for SONY. AC and DC operation. 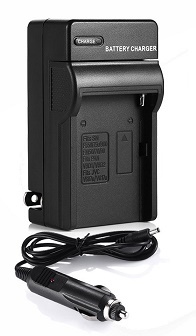 Battery clips onto charger; charger plugs into wall outlet, or into 12VDC in vehicle. Red LED = Charging; Green LED = done, full, and charger stops. 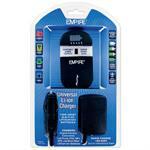 Charges batteries for the following cameras: SONY CCD-TR108, CCD-TR208, CCD-TR408, CCD-TR748, CCD-TR408E, CCD-TR748, CCD-TRV106K, CCD-TRV107, CCD-TRV108, CCD-TRV116, CCD-TRV118, CCD-TRV126, CCD-TRV128, CCD-TRV208, CCD-TRV218E, CCD-TRV228, CCD-TRV238, CCD-TRV308, CCD-TRV318, CCD-TRV328, CCD-TRV338, CCD-TRV408, CCD-TRV418, CCD-TRV418E, CCD-TRV428, CCD-TRV438, CCD-TRV608, CCD-TRV730, CCD-TRV740, DCR-DVD100, DVD101, DVD101E, DVD200, DVD201, DVD201E, DVD300, DVD301, DVD91, DVD91E, PC100, PC101, PC101E, PC101K, PC103, PC104E, PC105, PC105E, PC105K, PC110, PC110E, PC115, PC115E, PC120, PC120BT, PC120E, PC300K, PC330, PC6, PC8, PC9, PC9E, TRV10, TRV10E, TRV11, TRV14, TRV140, TRV140U, TRV145, TRV15, TRV16, TRV16E, TRV17, TRV17K, TRV18, TRV18K, TRV19, TRV19E, TRV20, TRV20E, TRV22, TRV228, TRV22E, TRV22K, TRV230, TRV235, TRV238, TRV24, TRV240, TRV240K, TRV245, TRV25, TRV250, TRV250E, TRV255, TRV260, TRV265, TRV27, TRV30, TRV300, TRV300K, TRV30E, TRV325, TRV33, TRV330, TRV33E, TRV33K, TRV340, TRV345, TRV350, TRV350E, TRV355, TRV355E, TRV38, TRV38E, TRV39, TRV40, TRV428, TRV430, TRV46, TRV460, TRV50, TRV50E, TRV530, TRV6, TRV60, TRV60E, TRV70, TRV70K, TRV725, TRV730, TRV738, TRV740, TRV75, TRV75E, TRV8, TRV80, TRV828, TRV830, TRV840, TRV8E, TRV8K, TRV940, TRV940E, TRV950, TRV950E, DSC-F707, F717, F717E, F828, S30, S50, S70, S75, S85,Mavica MVC-CD200, MVC-CD250, MVC-CD300, MVC-CD350, MVC-CD400, MVC-CD500, MVC-CD250, CD-300, CD350, CD400, CD500, CCD-TRV96K, DCR-DVD100, DVD101, DCR-DVD200, DVD201, DCR-DVD300, DVD301, DCR-DVD91, DCR-HC1, DCR-HC14, HC15, DCR-HC88, DCR-PC6, PC8, PC9, DCR-PC100, PC101, PC103, PC104, PC105, DCR-PC110, PC115, PC120, DCR-PC300, PC330, DCR-TRV6, TRV8, DCR-TRV10, TRV11, TRV12, TRV14, TRV15, TRV16, TRV17, TRV18, TRV19, DCR-TRV20, TRV22, TRV24, TRV25, TRV27, DCR-TRV30, TRV33, TRV38, TRV39, DCR-TRV40, DCR-TRV50, DCR-TRV60, DCR-TRV70, TRV75, DCR-TRV80, DCR-TRV116, TRV118, TRV140, TRV145, TRV150, DCR-TRV230, TRV235, TRV238, TRV239, TRV240, TRV245, TRV250, DCR-TRV255, TRV260, TRV265, TRV270, TRV280, TRV285, DCR-TRV300, TRV325, TRV330, TRV340, TRV345, DCR-TRV350, TRV351, TRV355, TRV360, TRV361, DCR-TRV430, TRV460, TRV480, DCR-TRV530, DCR-TRV725, TRV730, TRV738, TRV740, DCR-TRV828, TRV830, TRV840, DCR-TRV940, TRV950, DSR-PDX10, HDR-HC1, HDR-SR1, HDR-UX1, HVR-A1U, Cyber-shot DSC-S75; more. 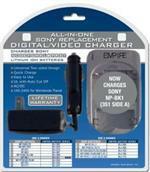 DVU-SON1 : All-in-one charger system for Sony digital camera batteries. AC & DC worldwide operation; smart charge with automatic shut-off. Charges MANY Sony batteries (see x-ref list). USC-001 : Universal Charger for most 3.6v - 7.4v Li-ION batteries. Charges from Wall outlet or 12VDC vehicle socket. Has adjustable sliding contacts to meet battery contacts.